Did you catch our CEO John Ashcroft in April’s edition of The Barker? John was interviewed as one of ‘The Faces of the Future’, to talk about his passion and vision for the fast-growing region of Mount Barker. 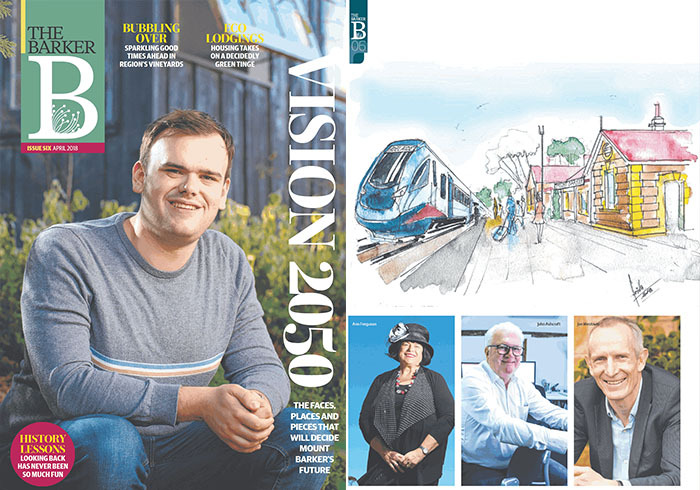 Looking ahead at ‘Vision 2050’, it’s clear the city’s future is looking bright. In fact, over the next 25 years the population will more than double, as council’s plan for it to become “the most liveable place in South Australia” unfolds. At Beyond Ink, we’re proud to play our part in developing the growing region – we currently have more than 80 projects in development in the Hills; including designing the new Wolf Blass Museum and Gallery in Hahndorf’s main street, and the new Aldi store in Mount Barker. As John is quoted in the article, “Mount Barker is tremendous” – there are many lifestyle options available in the area now; and “the population moving there” has encouraged that demand. As Mount Barker evolves, ensuring sustainable growth will be key; as will the preservation of the region’s individuality and authenticity.